Tomato Septoria leaf spot: Help!... need advice!! After having tomatoes that were the envy of the community for years, we have had our crops completely wiped out for 3 straight years now from a combination of Septoria and late blight. We have tried switching garden spot to over 0.5 miles, got new tomato cages, tried pruning off infected branches as they developed, and it still kills our tomatoes! I hate the thought of spaying, but I don't know what else to try. We try to grow 60-100 plants each year for salsa and canning, so it is a devastating loss! If we do have to spray, what should we use that will be effective, and least harmful to us? I have heard Serenade works... it has worked for me on powdery mildew, but I haven't tried it on Septoria. Anyone have great success with anything? I hear copper sprays are effective, but are they dangerous? Any help would be greatly appreciated! Thanks! Re: Tomato Septoria leaf spot: Help!... need advice!! Ive read that copper spray would work, there are ones specificly made for treating fungicide. Have not tried my self tho so i cant tell you how good it is, but may be an option to look into. Well, you said septoria and late blight and then focused on the septoria. Is it really the septoria that is killing the plants? In my experience late blight is a much more deadly disease. Tomato plants can live and produce pretty well even though infected with septoria. Mine almost always get it at some point in the season. If I just keep removing and destroying any infected leaves/branches, they keep going well. Late blight is a whole different story. If you know you have had late blight in the past, you will need to do fungicidal treatments preventatively, from early in the season. It can be prevented, but not really cured. Organic plant fungicides include diluted milk, baking soda solution, hydrogen peroxide. You can't use them together, but you can rotate different ones. You need to reapply something after every rain. Actinovate (which contains the beneficial bacteria Streptomyces lydicus) works when used as a preventative spray. Be sure you keep your tomato beds well mulched so soil can't splash up on the plants and only water the soil, not the leaves. Good advices being given already. I was wondering if you grow your tomatoes from seeds or you buy the plants? Are they different varieties from what you used to grow? Would you consider growing more resistant varieties? Also, it would be helpful to know where you are located. When do you plant them and what do they look like when you do? I would assume you are using same planting techniques that were successful before, but changing locations may have changed the kind of soil you are planting in. How do you prepare the tomato bed? Great question from rainbowgardener! All I know for sure is that I sent the plants for testing and they came back for both late blight and Septoria. I assumed it was Septoria, as I thought late blight would not be as deadly. I know when the leaves start dying back (about midseason) it moves fast through the plant, and spreads fast from one plant to the next even though I try keeping ahead with pruning of dead leaves. I have been using a combination of purchased transplants, and seeds I start myself. I know that the government warned of late blight in my area because some transplants available in stores were contaminated at the greenhouses. I am sure I will have to try some sort of spray this year (as much as I hate to). I will probably try Serenade or one of the other ones mentioned here and hope for the best! Ok.. I just looked up photos on the net, and I am quite certain my main culprit is Septoria... It all starts with the spots! As rainbow noted, Actinovate is a bacterial spray, used as a prophylactic, and this is what I use, starting a couple weeks after transplant. I also use the leftover from the year before as a soil drench, before transplant - I figure it is probably still active, but I like to get a fresh batch; though I don't know if it really helps, I figure that it can't hurt! I have also used H2O2 as a spray, though that was more after they had come down with early blight, a number of years ago, when that swept much of the country. That and a copper spray helped some, but it just seemed that some varieties were much more resistant, while some were wiped out overnight. That was when I found out about Actinovate, and have used it since then, with great success, though there have not been any nationwide blight epidemics to test it out! BTW, I have found that the best (i.e. cheapest) source for actinovate is ebay. Thank you to everyone who has posted so far. Does anyone know if Actinovate works on Septoria as well as blight? I dunno, maybe your situation is different. I'm still not entirely convinced. The septoria may well come first; late blight is called that because it tends to occur later in the season. LB doesn't over-winter in the soil as much so has to come up from the south each year. But just because the septoria starts first, doesn't mean it's the one that's actually doing the killing. Once your tomato plants look like this, they will die very rapidly, as opposed to keeping on going with septoria spotted leaves through the end of the season. Incidentally the article the first picture is from, claims to be able to reliably prevent early and late blight in tomatoes. I can't comment at all, but it would be great if someone wanted to test it for us!! "The combination of copper wire and hydrogen peroxide is a great organic way of preventing tomato blight. Copper, as a treatment for blight, has now become the base by which many blight treatments have been created around. Copper sulfate is one organic choice but an easier technique utilizes a common copper wire. To begin the process that will protect your tomato plant from blight requires that the tomato plant be planted in the ground. The procedure needs to be done early in the season while the stem is soft and not woody. You will need 3-inches of 16 gauge [copper] wire per tomato plant. The tomato stem needs to be about the size of a pencil when this process is done. To commence with the procedure, measure Ã‚Â½*-inch from the top of the soil line. At this point, run the copper wire through the stem. Once the wire is through the stem, adjust the length on each side so that they are equal. At this point, the ends can be left up or bent down into the soil. After the wire has been run through the stem, mist each plant with undiluted 3 percent hydrogen peroxide. This hydrogen peroxide treatment will need to occur once a week." These treatments combined will prevent both early and late tomato blight. *that's the way it was in the article. 1.5 inches?? It would be really nice to see a controlled study. The undiluted 3% H2O2 is an effective antifungal by itself (see my previous notes). All the benefit of this treatment may come from weekly applications of H2O2. It would take controlled study to know whether the copper wire threaded through the plant really adds anything. OK... I believe you! Good article! It's all good points in there about keeping tomatoes above the ground (and I would say mulched) so that soil can't splash on them, keeping good air circulation, etc I used to do no pruning on my tomatoes, but they get pretty crowded in the cages. I found that I stay ahead of the septoria better if I prune to open up the centers and keep air circulation through the plant. I don't do much spraying of anything, but if you are concerned the anti-fungal sprays done preventatively will help also. If it is the septoria that is the problem, that is good news, because it is easier managed than the blight and the plants can stay productive, even though they have lost a lot of leaves. Some years, by the end of the season my tomatoes mainly only have leaves at the top, with long bare stems underneath. But they keep producing. 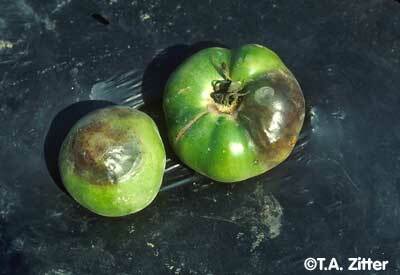 Septoria will infect other solanaceus fruit like peppers, eggplant and other nightshades including the weedy relatives. Fungal spores can spread by the wind and persist on tools, equipment, boots, stakes and cages. Copper should be effective on septoria as well, but you need to scout the area for alternate hosts and get rid of them too. Bordeaux mix, or copper sulfate and chlorothalonil should work if sprayed preventively weekly when environmental conditions, wet and humid weather favor the disease. Although I do not like to keep too many chemicals around, it might be better to alternate your fungal sprays and combinations as well until you find a good combination. You will need to check out which ones are compatible. Unfortunately there are no cultivars resistant to septora, so sanitation, preventive fungal sprays, and crop rotation (A four year rotation out of any of the solanaceous family). Defiant â€“ Determinate (bush) plants produce round, medium size red fruits, rated at 70 days to maturity. Iron Lady â€“ Determinate (bush) plants produce round, medium size red fruits, rated at 75 days to maturity. Jasper â€“ Tall indeterminate (cordon) plants bear trusses of red cherry tomatoes starting 60 days after planting. An All America Selections winner and RHS Award of Merit. Lemon Drop â€“ Indeterminate (cordon) plants bear hundreds of small yellow-green tomatoes in 80 to 90 days. Open-pollinated heirloom variety, a sport of 'Snow White' cherry. Matt's Wild Cherry â€“ Sprawling indeterminate (cordon) plants bear scads of tiny red cherry tomatoes starting 55 to 60 days after planting. Open-pollinated heirloom from Mexico. Mountain Magic â€“ Vigorous indeterminate (cordon) large red cherry tomatoes, rated at 75 days to maturity. Mountain Merit â€“ Determinate plants produce large red round fruits about 75 days after planting. An All-America Selection winner. Mr. Stripey â€“ Indeterminate (cordon) plants produce medium size round fruits marbled with red and yellow in about 80 days. Open pollinated heirloom. Plum Regal â€“ Determinate plants produce red plum tomatoes weighing 3 to 4 ounces each, rated at 80 days to maturity. Between the two Septoria is probably the better one to have since phythoptora will remain in the air and the soil for years. This publication shows the difference between the spots side by side. I would not rule out phythoptora especially if it is in your area and your are buying transplants from the stores. I have not been able to get sweet basil to grow except for a brief time last year. Then Walmart was selling basil that were infected with downy mildew and within two weeks my basil was infested again and I had to pull them. I believe my tomatoes have septoria leaf spot. How to help..